On his third outing for Criss Cross, pianist Joel Weiskopf returns to the trio format that launched his career as a leader. His sidemen require no introduction to jazz fans: bassist John Patitucci and	drummer Brian Blade, fresh from extensive touring with the great Wayne Shorter,	are on hand to aid Weiskof in his quest. 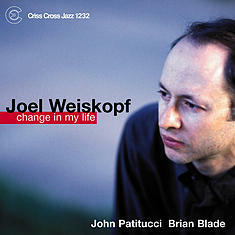 Change in my Life features nine originals and one heavily reworked standard,	all of which attest to Weiskopf's gifts as both as a player and composer.